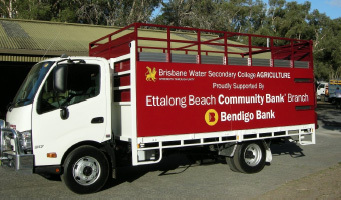 Ettalong Beach Branch of Bendigo Community Bank recently donated a new Hilo diesel truck to the Agricultural Farm of Brisbane Water Secondary College, Umina Campus. The truck, complete with a purpose built cage to carry livestock and feed to country shows and events, cost Bendigo Bank in excess of $80k. The project which took 12 months to complete, was initiated during a casual conversation between the school Head Master and a Rotarian from the Rotary Club of Umina Beach, at the annual AgFarm BBQ. At recent country shows the school won major awards, the new truck was a major factor in transporting competing cattle and feed to these events. The new vehicle was also a hit amongst the other competing schools who would just love one like it. Last week, the truck was officially handed over to the school at an event attended by NBN News, and The Express newspaper, where students, the Principal and the Branch Manager of Bendigo Bank were interviewed. A video of the event has already been aired on NBN News and an article appears in the current editions of Peninsula News, Central Coast Express Advocate, The Land and other publications.